This is only my second year planting garlic, although I’ve already happily reaped the harvests of garlic sown in 2013 and 2014. 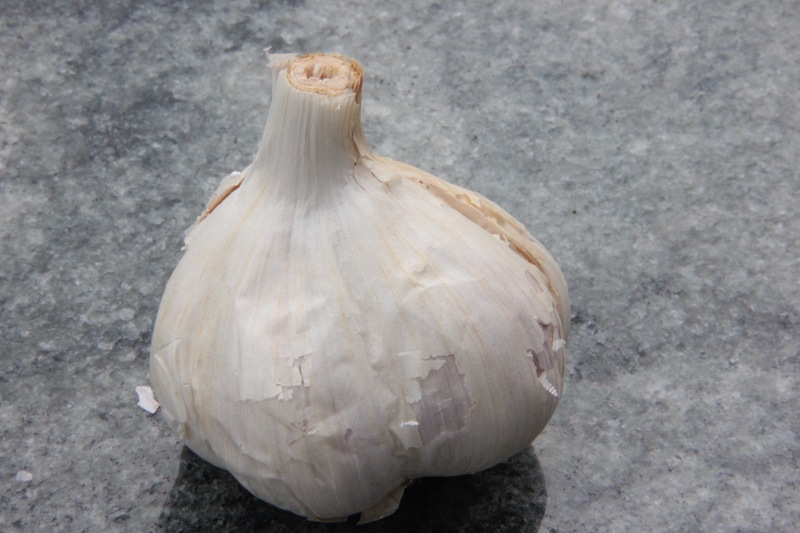 I am now a true believer in the cultivation of the stinking rose, a term for garlic which originated in ancient times. Last year I planted roughly 25 cloves from four or five heads of German Red and Blanak varieties in the fall. Both of these are hardnecks, which do best in our northern climate and have robust, complex, and sometimes spicy flavors. I love the way their skins slide off easily after harvest, making prep a breeze. The softnecks are differentiated by milder flavors and a softer, braidable neck or top stem that grows above ground. 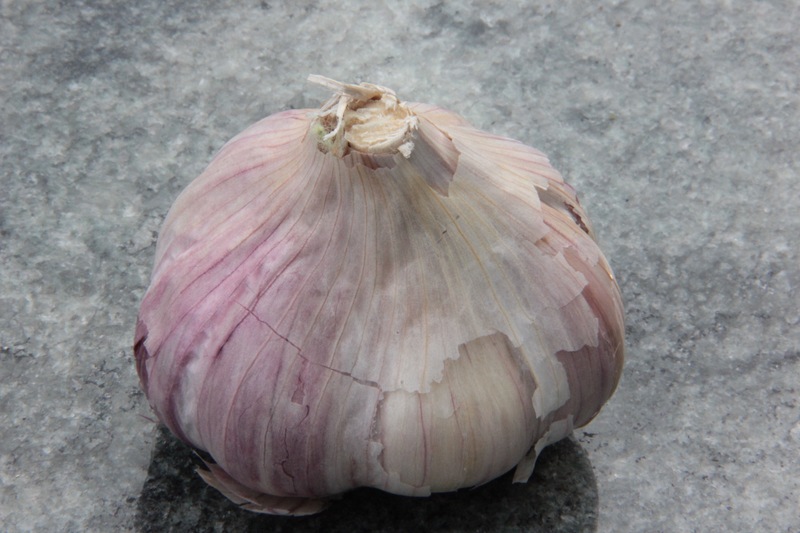 Soft neck garlic stores well, is more challenging to prep, and is the type most commonly sold in grocery stores. The German Red and Blanak were a big success, evidenced by the couple of pounds of minced garlic mixed with olive oil in our freezer. My one mistake was not saving any heads for re-seeding! I also forgot to purchase seed garlic in September and ended up calling local nurseries to locate some when favorite online sources sold out of hardnecks. I was able to purchase eight large heads of Music and Duganski which yielded over 50 plump cloves. Duganski is the purple striped variety shown above and Music is shown below. 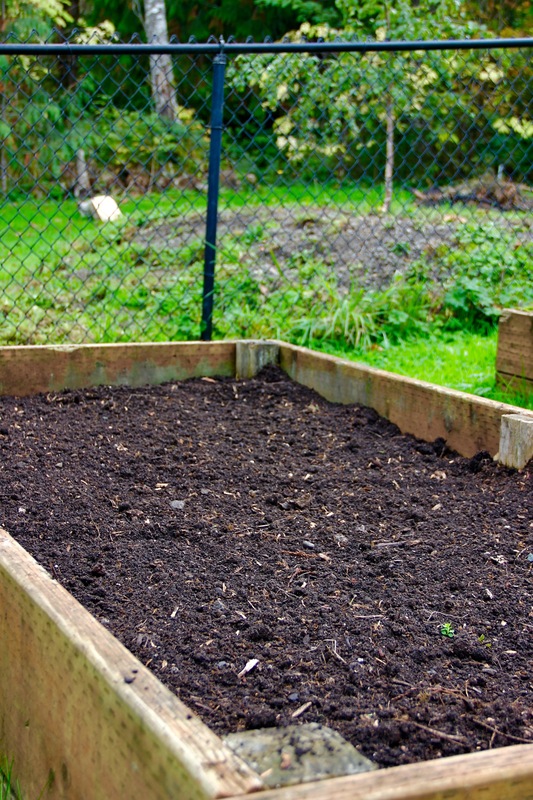 My raised bed was enriched by two wheelbarrows of Coppertop compost, then leveled. I planted the garlic cloves 3-4 inches deep and 6-8 inches apart although some folks plant them just 2 inches deep. Pointy side up, just like all bulbs. Now we wait for healthy roots to develop over the winter and green shoots to grow in spring. This entry was tagged Duganski, gardening, garlic, Music garlic, Olympic Peninsula, Pacific Northwest. Bookmark the permalink. I love reading about your “little bit of everything.” Just when I think you’ve planted (and harvested) it all you come up with something new. 🙂 Always fun reading about the goodies in your garden. Thanks, LaNae! I thoroughly enjoy checking out what you’ve been up to also! A timely reminder that I have to get my garlic planted soon. I buy seed garlic in August at the annual local Sharing Farm Garlic Festival, where they usually have a variety of three or four hardnecks. 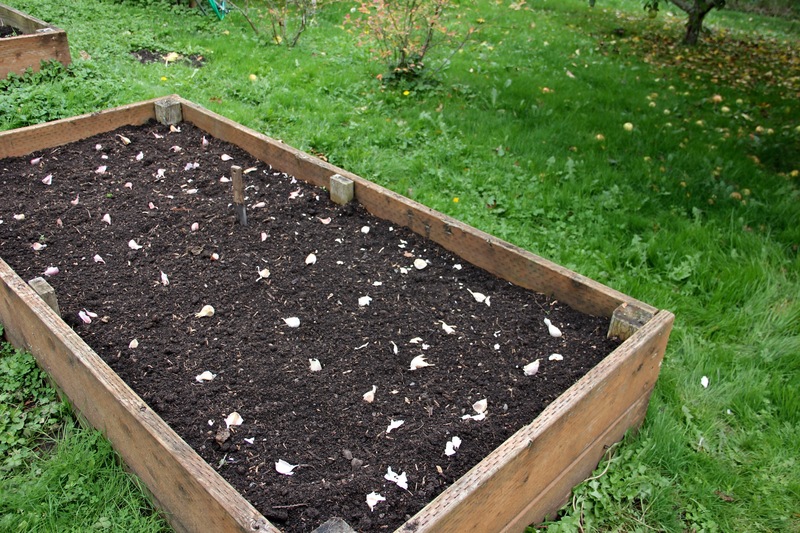 Last year I planted 36, fearing the worst, because the year before I’d lost 80% of my garlic to white rot. But in spite of the extreme weather this past summer (heat and drought), they grew beautifully and I harvested them as early as June. It is so satisfying to be able to eat the bounty of one’s garden, which one has carefully tended and nursed along, making sure that it was safe from harmful contaminants (of course, there is always the threat of rats ….). Woah, white rot sounds scary, Sabine. Almost as awful as those darn rats! Yes, the bounty you speak of is worth all the effort, isn’t it?